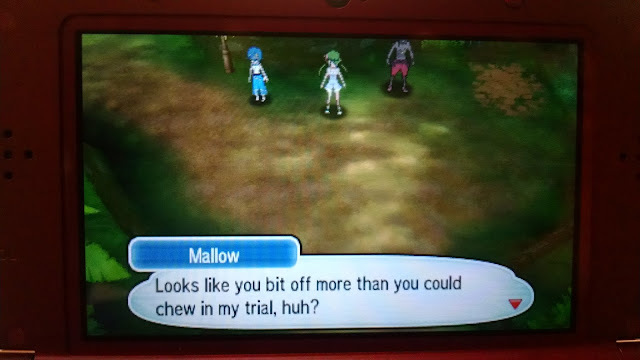 Mallow has such a way with words, doesn't she? She is correct! I underestimated the trial and was handed a loss for my troubles. I spent about two days playing on and off training new Pokemon to conquer this trial, although I only was able to use 3 people after it was all said and done. 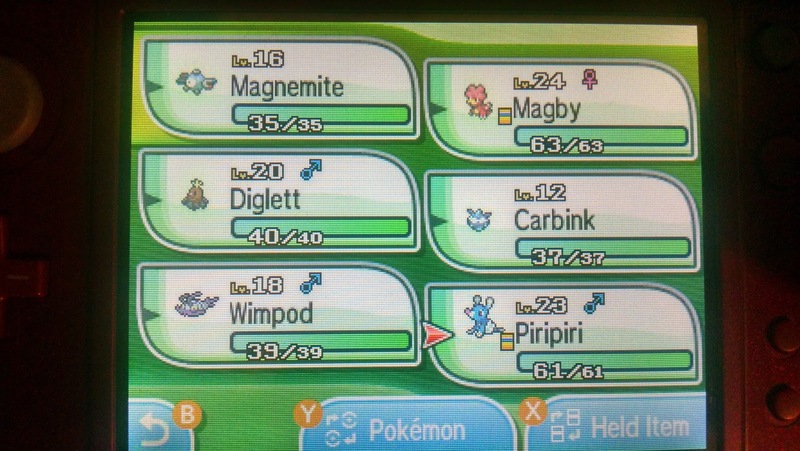 I stuck with Magby, Salandit and Oricorio. Back on the topic at hand, Lurantis knew Bug-type moves, which makes sense seeing how it looked like a giant pink mantis. If you recall type charts, Bug-type moves are super effective(2x) against Psychic Pokemon and not effective(0.5x) against Flying Pokemon. I keep making the mental mistake of believing Grass is super effective against Electric Pokemon when actually Electric-type moves are not effective against Grass Pokemon. 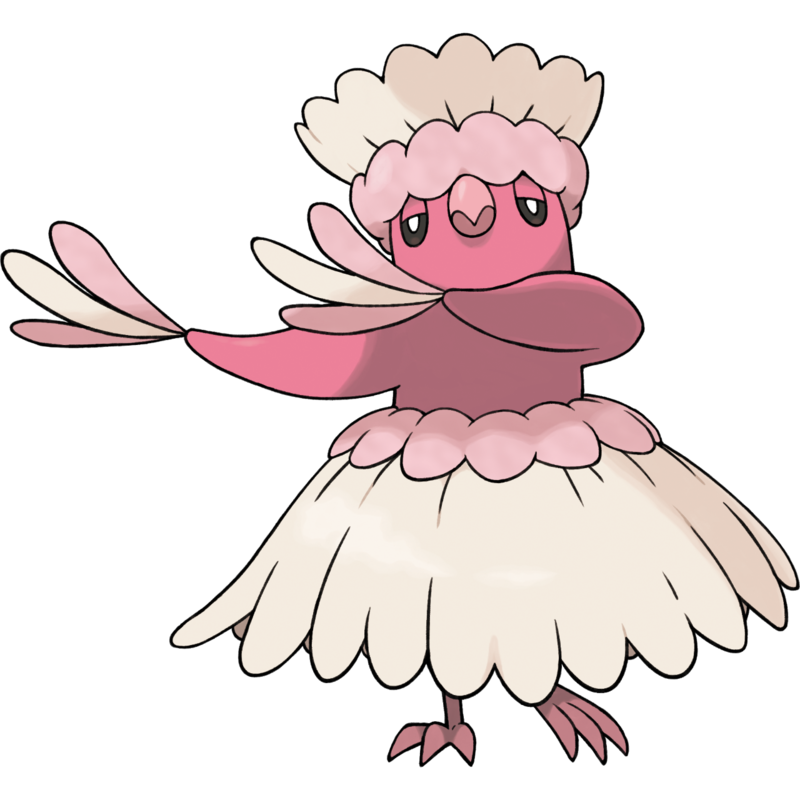 So by using the Pink Nectar on my Oricorio, its new form lost it's natural defense against Bug-type moves which did not help my battle against the Totem Pokemon. I found that line peculiar. Lurantis knew Synthesis, a grass moves that heals the user(A taboo for bosses! Arg!!) . 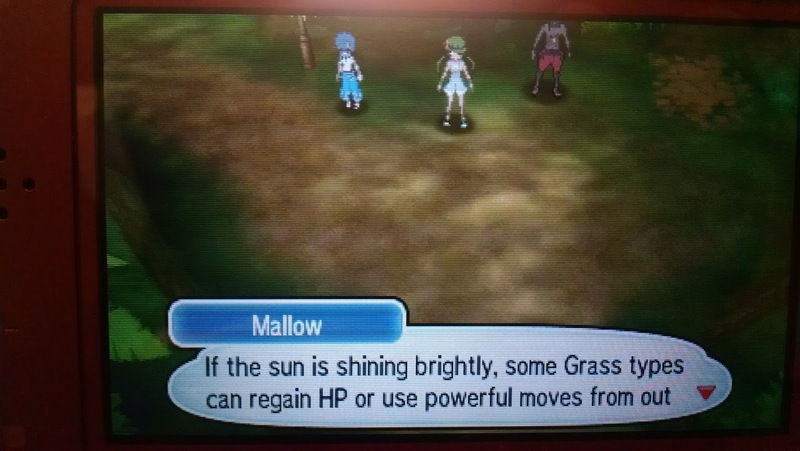 I knew it's effect grows stronger when the weather is sunny and that certain moves like Solar Beam can skip their charge phase and be immediately used but couldn't figure out where this came into play. Until I fought it again and it called in Castform as it's helper Pokemon. Castform's from Gen 3 and both the Pokemon and that Generation's gimmick was the introduction of weather. Castform changes form and type depending on the weather. Fire on sunny days. Ice during hailstorms and Water during rainy days. Naturally, it knew Sunny Day, which caused the above mentioned effects as well as powered up Fire-type moves. Thanks to Castform, this Totem fight became more difficult than I would have imagined. I'm almost happy it never dropped to low enough health to summon allies in our first encounter. Boy, despite Sunny Day working in both our favors I still had a hard time clearing this trial. I changed Oricorio's form back to the yellow Electric/Flying form. I had it first in my party because it was more of a glass cannon. I spammed Flying moves and occasionally used my buff/debuff skills to lessen the damage the totem Pokemon could crank out. It ended up being a brawl because every turn I would try to do more damage than what it could heal. 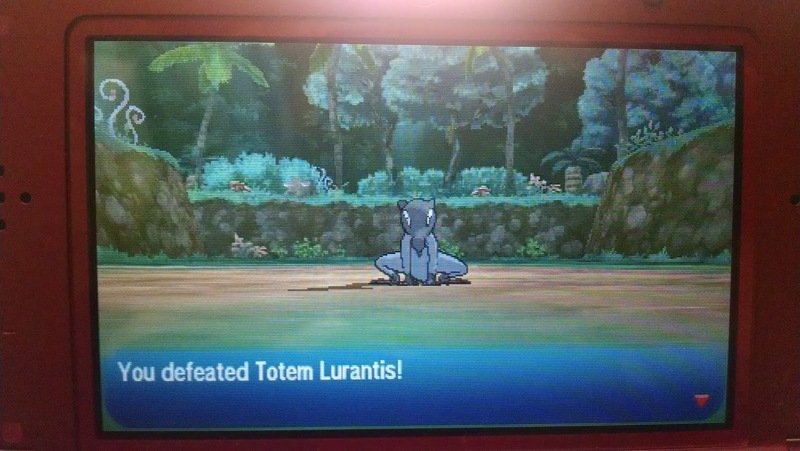 I secretly wished I could have one shot the Totem Pokemon like in the previous trial but that would not have been as interesting. The real trouble I had was fighting the Castform powered up from the sunny weather. Magby and Salandit were the only ones who could fight the Castform and not receive extra damage. I made the mistake of making the rest of my party some type of Bug-Type hybrid. We made it! Time to take on Akala Island's Kahuna! I'm very excited to take her on. 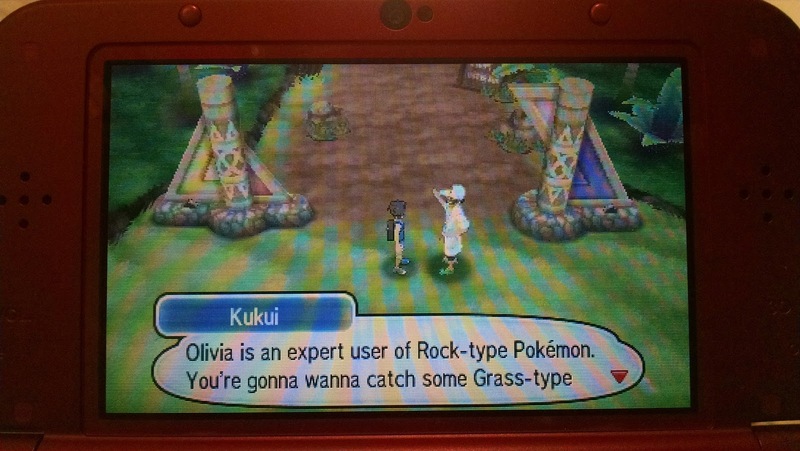 Partly because I won't have to go out of the way to train new Pokemon to fight her. I can finally break out my Starter Pokemon, Bounsweet and Alola Diglett!! But first, I was instructed to visit a Lab outside Route 6. Instead of flying to Heahea City and walking there, I decided to take the scenic route and run straight through Routes 5 & 6 to the waypoint. Partly through Route 6 I ran into Hau just as he finished Mallow's Trial. I was worried he was going to challenge me to a battle because I never switched out my party after the trial. Luckily that wasn't the case! Since I was on the way, I decided to stop by Royale Avenue. I wanted to participate in the Battle Royale but my party was way too low. I thought the opponents would scale to the highest Pokemon you are participating with but was not the case! That's alright, I can't wait to bring my party back here when the average level is LVL 50. Detour aside, I kept heading down Route 6 until I reached the waypoint outside the Dimension Research Lab.This was a plot related way-point. It was explained this lab is doing research on Pokemon that can move between dimensions and that the Ultra Beasts are trying to get into our world from cracks in the dimension. Something about the Alola Guardian Pokemon fending off the Ultra Beasts from invading our world. We were introduced to a new character, Professor Burnet. She's Professor's Kukui's wife, a researcher at the lab and left Lillie in Kukui's care after she found Lillie unconscious on the beach. Once that was done I was told I needed to travel through Diglett's Tunnel to reach Olivia. I was also to warned to be wary of Team Skull along the way, which I look forward to! I find them funny despite being known as the bad guys. I'm signing off this week outside Diglett's Tunnel with the above party. 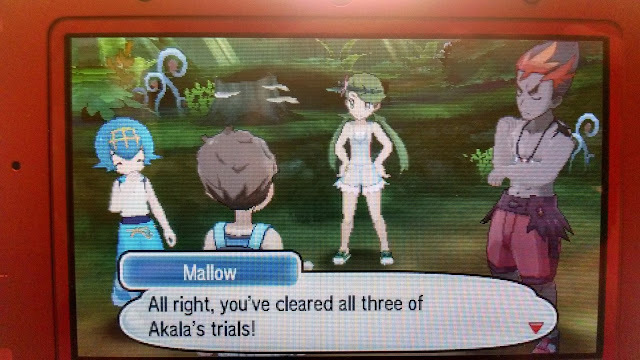 I feel like I did not do much exploring this week as I wanted to because I wanted to train a party to pass Mallow's Trial. Also, I felt the pool of Pokemon I wanted to use to clear the trial was small, as the past areas had plenty of Rock,Grass and Water-type Pokemon. I'm going to try and do better having multiple types on standby to assure I do not get swept by another Totem Pokemon. Of course, the further along I go, the better chance I'll have access to more diverse Pokemon. My end goal is to have a few boxes, if I were to be ambitious, of favorite Pokemon that I'll always want in a party as well as multiple boxes of Pokemon to fill in the gaps of these teams. For example, I expect to run into Flying/Rock/Ground type Pokemon in Diglett's Tunnel, so I've brought with me Pokemon effective against those types. But honestly, I was almost wiped out by a pair of Zubats in a wild encounter. I kept bringing the Zubat(s) to critical health instead of knocking them out and they kept summoning allies. 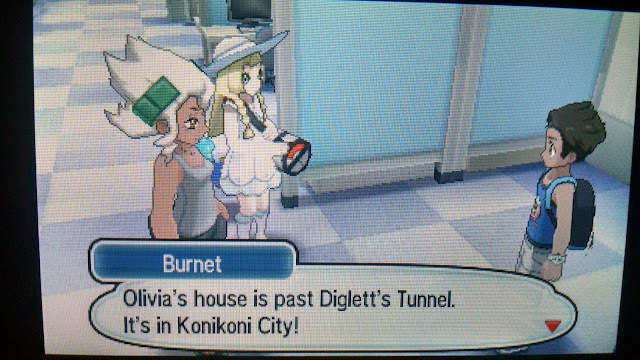 Look forward to next week's entry, where I'm stuck in Diglett's Tunnel, terrorized by hordes of Zubats! My Favorite Video Game Soundtracks!